Credit union advocates argue that their financial institutions rode out the financial crisis better than commercial banks. Are their claims backed up by the numbers? Credit unions are owned by their customers (or, in industry parlance, "members"). Big banks are owned by their shareholders. A key narrative of the recent Bank Transfer Day was to pit normally sleepy credit unions against the big banking industry. 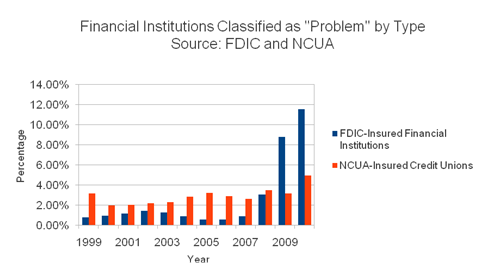 Credit union skeptics are quick to point out the fact that credit unions hardly went unscathed during the 2008 financial crisis, yet CU advocates argue that their institutions fared better than commercial banks. Are their claims backed up by the numbers? To find out, I looked at statistics generated over the past 10 years by their respective regulators, the Federal Deposit Insurance Corporation for banks and the National Credit Union Administration for credit unions. What I found is that in the case of failures, the years before the financial crisis seem to have been a wash, with both types of institutions failing at about the same low rate. When the financial crisis hit, however, the story changed. In 2008, the rate of commercial bank failures was almost triple that of credit unions (0.60% to 0.23%), and that increased to almost five times the credit union rate in 2010 (1.86% to 0.40%). While the sluggish economy seems to have also negatively affected credit unions, they experienced nowhere near the surge of failures seen in the commercial banking sector. A similar pattern is evident in the case of institutions considered to be problematic by NCUA or FDIC. 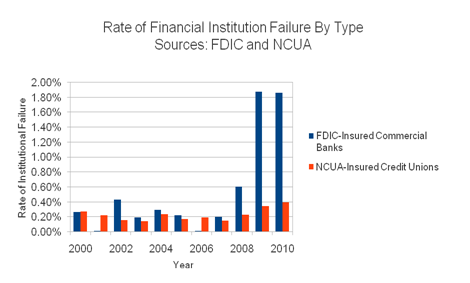 Though slightly muddied by the fact that the FDIC does not differentiate between commercial banks and savings banks in their statistics, the picture is still pretty clear: While negatively affected by the crisis, credit unions did not experience the sort of radical departure from their baseline rate that banks did. "The Joys of Credit Unions"
"Credit Union Pros and Cons"
"Thousands Vote With Their Feet, Say Goodbye to Big Banks"